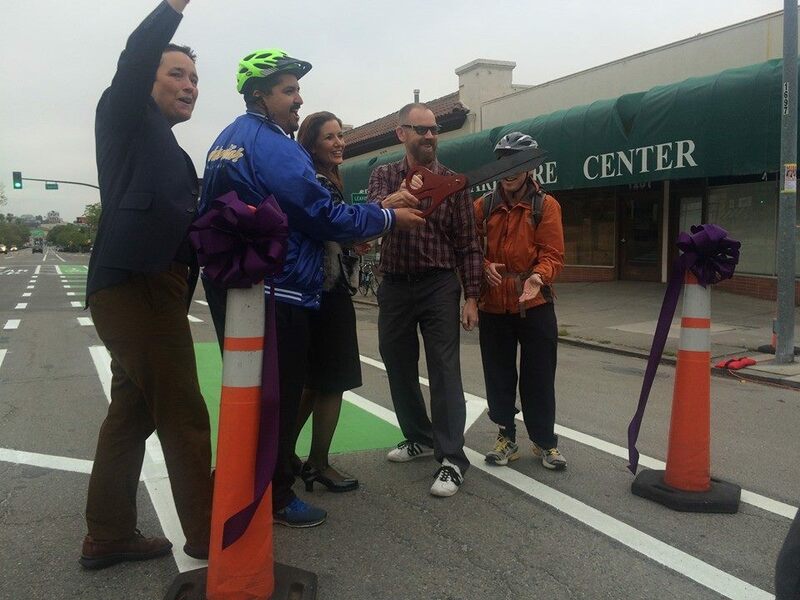 A crowd of helmeted cyclists cheered as Oakland Mayor Libby Shaff and councilmembers from Oakland and Piedmont cut the ribbon to celebrate the opening of a bright green dedicated bike lane on Grand Avenue, connecting the two cities. 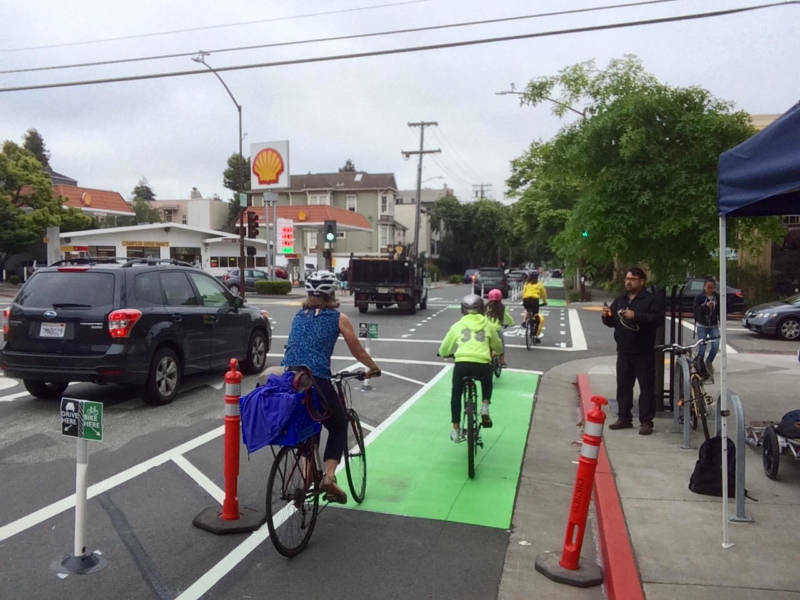 Yesterday's event, marking the 22nd annual Bay Area Bike to Work Day, was one of four ribbon-cutting ceremonies for new dedicated bike lanes in Oakland, Piedmont and Berkeley. This year, more than 19,000 participants rolled onto East Bay streets to commute to work and take advantage of various Energizer Stations that provided snacks, raffles, and support for the commuters. The huge turnout reflects a broader trend; now more than ever, East Bay residents are choosing bikes for their morning commutes. The number of bike commuters in Alameda County has doubled in the past five years, says Renee Rivera, executive director of Bike East Bay. The nonprofit advocacy group has been helping design and lobby for the new bike lanes. Three of the four new bike lanes have protective barriers between cyclists and the traffic. “It feels relaxed, it feels much safer. It completely transforms the experience of riding on the streets,” Rivera says. On many bikeways, cyclists ride in a narrow lane with traffic on one side and parked cars on the other, says Rivera. This can set riders up for “dooring,” in which the door of a parked car flies open and the cyclist crashes into the door and hurtles through space over the front of the door. In a protected bike lane, the parked cars or another barrier like flexible posts separate the cyclist from traffic, and the cyclist rides closest to the curb. Emeryville completed a two-way protected bike lane on Christie Ave, connecting the Bay Trail north of Powell Street to the Bay Bridge bike path. Berkeley opened a protected lane on Fulton Street that connects the UC Berkeley campus and Oxford Street to Channing Way Bicycle Boulevard. The lane fills in a dangerous, two-block gap in the bike network, a project the city approved after a serious accident occurred in February. 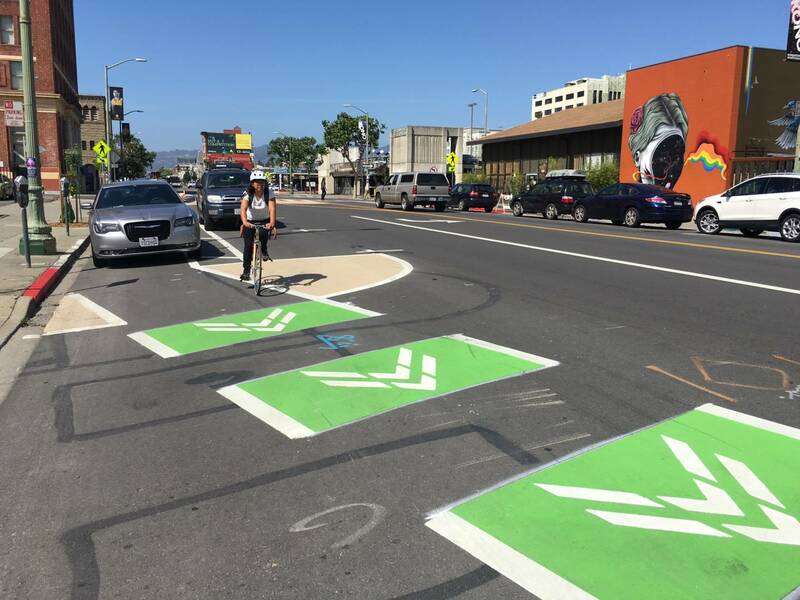 Oakland opened its first protected bike lane earlier in the week on Telegraph Ave. between 20th and 29th. Some 1,200 commuters travel the corridor every day. The new set-up uses parked cars to separate the riders. The city plans on extending the bike lane to 40th St, and eventually all the way to the Oakland border. The new projects are funded partly through Alameda County’s Measure BB, a transportation sales tax meant to pay for improvements in modes of transportation, including for bicycles. 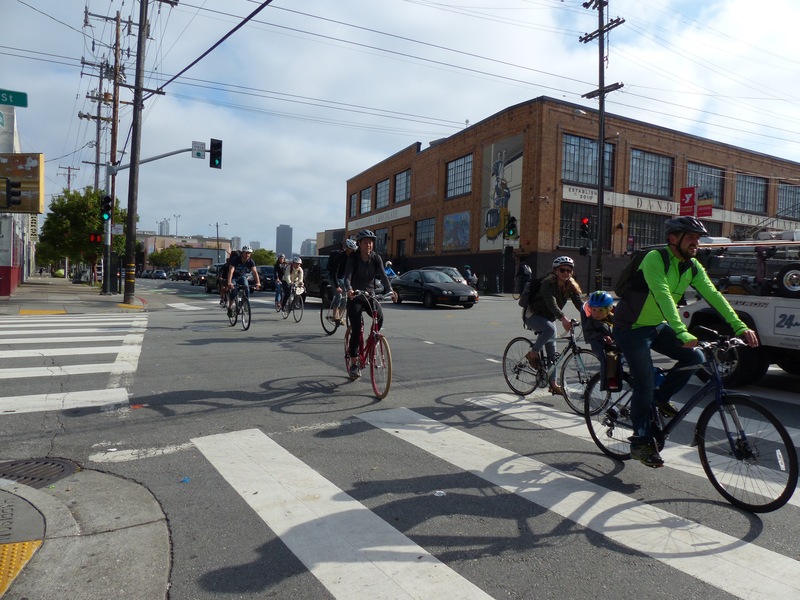 “Bikes are important for Oakland because we’re a little more spread out,” Shaff says. “Owning a car is not feasible for everyone. We want to make cycling as comfortable as we can for everyone. In San Francisco, thousands of people commuted for Bike to Work Day; a counter on Market Street ticked off 2,360 people riding for their morning commute, says Chris Cassidy, communications director for the San Francisco Bike Coalition. Riding to work has always been popular in San Francisco, home to the monthly Critical Mass cycling event. And bike commuting continues to grow, with an 8.5 percent increase in 2015 alone. The city has varying degrees of protected bike lanes: fully protected lanes that prevent cars from driving into them, lanes protected by parking, and a pilot elevated bike lane.